Motem helps HSBC Premier Managers, to exceed their acquisition target by 61%. One of the main benefits of an HSBC Premier personal bank account is the bespoke advice provided by the the Premier Relationship Manager. As well as providing a first rate service for their existing portfoilio, the Managers are also responsible for finding new customers. Building relationships through networking is one of the most successful ways of doing this. But, as is often the case with professionals, networking is something that many of them struggle with. And this reluctance to go to events means that they are missing out on new business opportunities. To address this situation, Frank Mowat, Head of Premier Banking SouthWest, and his team designed a one day conference: Networking for Success. It was held in Bristol, in Oct 2010 and he asked me to run a session which would help to improve their confidence and effectiveness. 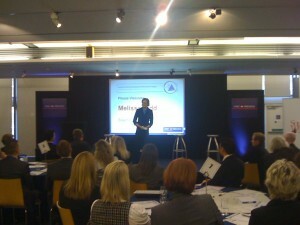 Melissa has subsequently been re booked by the Bank in a number of other regions, who are keen to share in the success. “Melissa ran a very engaging and highly effective Networking Know How session at our conference which absolutely hit the spot,” said Frank. “Running through what to do before, during and after a typical event was incredibly helpful to ensure we don’t let opportunities slip through our fingers. The confidence in the room dramatically increased.